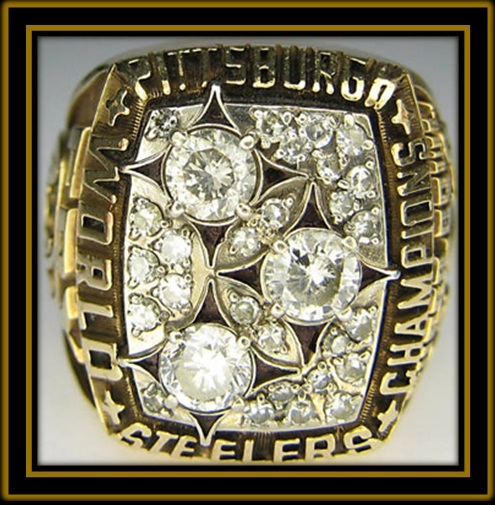 This entry was posted in Ring of Champions and tagged 1978 Dallas Cowboys, 1978 Pittsburgh Steelers, Battle of Champions, John Stallworth, Lynn Swann, Mel Blount, Randy White, Rocky Bleier, Roger Staubach, Super Bowl, Super Bowl Rings, Super Bowl XIII, Terry Bradshaw, Tony Dorsett. Bookmark the permalink. 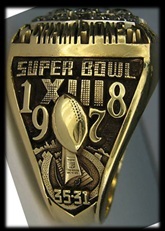 This one’s a perennial Top 10 Super Bowl without question. Two Hall of Fame teams giving everything they had. Bradshaw showed how clutch he was in big games, overcoming that sack-and-strip that Dallas scored on to keep the Steelers in the game. The Bleier TD, the Harris TD, the last Swann TD … all classics. The Cowboys still blame the interference call and Bradshaw calling “the wrong play” on the Harris run (not to mention that the ref got in the way of a potential tackler) … but they had their chances early as Dorsett was chewing up yardage. As a matter of fact, at the moment, I’m playing a seven-game “Silver Series” pitting the ’70s Cowboys against the ’70s Raiders, given that they only met once, in 1974, and missed so many opportunities to play a Super Bowl against one another because of the Steelers. You can see the results at our Facebook page; the series is tied at two games each, with the 1970 and ’72 Raiders winning, then the ’73 and ’75 Cowboys. ’76 and ’77 squads are up next.